Every two years, Certified Flight and Instrument Instructors have to renew their rating in one of three ways—by taking an online refresher course, attending a weekend ground school or taking a check ride with their favorite Designated Pilot Examiner (DPE). I’ve always kept my CFI up to date, but when I started making aerobatics my vocation, I only had time to instruct occasionally to help out a friend by giving a BFR, an IPC (Instrument Proficiency Check), or giving dual in a fun aerobatic airplane. The bi-annual recurrency training for CFIs is designed to keep them apprised of new regulations and rule changes. Rules and regs change, but I’m much more fascinated by the fundamentals of flight instruction that deal with human behavior and the learning process. How do you train students with varying backgrounds and motivations to become safe, responsible and skillful pilots? How important are the laws of learning? How can you be sure that your students won’t do anything stupid when you’re not there? Can you teach good judgment? My conclusion has been that it all comes down to communication. I’ve had the chance to teach a group of pilots under circumstances very different from what instructors usually encounter. And it helped me see through the noise of instructing theory and gain some lasting insights into the essence of what you do when teach someone about flying. It was in 1999 that I met Dr. Bill Clark, a wildlife conservation activist, who encouraged me to spend my time off-season from airshows teaching aerobatic and bush flying to the Kenya Wildlife Service pilots. Bill was involved with restoring and donating airplanes to be used by the Kenya Wildlife Service Airwing to help combat ivory poaching. 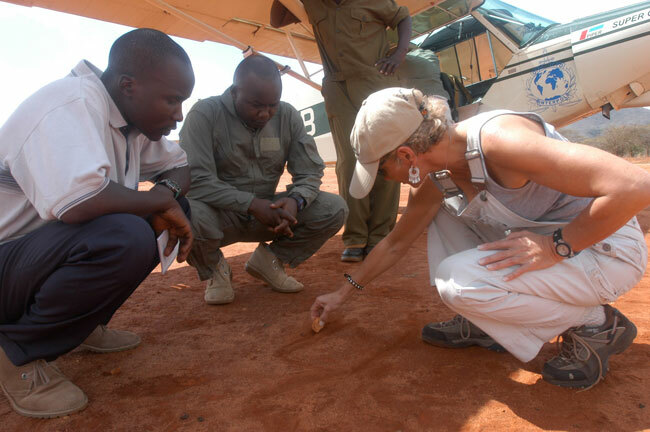 We felt that aerobatic and upset training would help improve the KWS pilots’ chances of survival while flying low-level in bush conditions, over vast distances in all kinds of weather, while sometimes being shot at by poachers. Since 2001, our training program has been ongoing and has given me a chance to use my CFI in a personally meaningful way. People have asked me what it is like flying with people from other cultures, especially when English is not their first language. In Kenya, people come from as many as 42 ethnic groups and generally speak three languages—Swahili, English and their own native or tribal language (e.g., Masai, Kikuyu, Luo, Somali). Some students speak the Queen’s English better than I do, but if not, I try to keep things simple and direct, which makes, in my opinion, a lesson no less effective—keep the airplane on the runway, keep the nose down on approach and keep the ball centered! Often the important part of a lesson happens on the ground, so when I’m teaching a student with limited command of English, we can still speak the same language by using aviation terminology, pictures and diagrams, even if it means drawing an airstrip in the dirt with a stick to describe a maneuver or procedure. The language of aviation is universal as long as everyone understands what you’re trying to communicate. When language and cultural differences exist, the instructor has to adjust, but mistakes can happen even when two people speak the same tongue. Regardless, miscommunication occurs easily and could have contributed to the 2013 Air Asiana accident in San Francisco. Did the co-pilot know the captain was flying below the glide path and not speak up? Not to mention the classic incident when the captain decided to initiate a go-around and asked for “Take-off Power” and the co-pilot instead heard, “Take off Power” and brought the throttles to idle. It could happen again. Even when there’s a language barrier, there are ways to break through it. Flying is serious business, but I always try to find ways to use my sense of humor. I had fun teasing one student, Anthony, a Masai, who doesn’t like loops. “Anthony,” I said, “you’re a Masai warrior, right?” “Yes, that is correct.” “You can hunt and kill a lion with your bare hands and a spear, right?” Yes!” “Then tell me, how can it be that you don’t want to do a loop? !” He laughed, and had to agree. Other times demand a more serious approach. One of my low-time Kenyan students was under a lot of pressure. I was helping him transition to a Super Cub from a conventional gear Cessna, and the head of the Airwing made it clear that if he didn’t successfully make the transition, he would be washed out and his flying career would probably be over. I found he flew very well but tended to stop flying the airplane after landing, letting the airplane veer off in one direction or another. With his limited English and my limited Swahili, we discussed it, and I thought we were making progress when, after landing but still at flying speed, he let the airplane veer off into the brush on the side of the runway, and into the bush we went. I immediately took control and slammed the throttle forward to recover, and we flew out of a potentially very bad situation. What could I say to this pilot whose English was good but limited that would help him? I really wanted him to succeed, so once we were on the ground and had inspected the airplane for damage, I said: “You must be the captain. If you don’t, you will be back to bagging groceries. You need to sit and think about this alone while I join the rest of the group for lunch. Meditate on what you want and what you have to do, and when I return you can show me.” I guess it worked because I’m happy to say he’s still flying for Kenya Wildlife Service today. Our aerobatic school attracts students from all over the world, so in-cockpit communication can be a challenge. Recently we were visited by a Chinese Air Force pilot who wanted to experience flying the Extra. I knew he was a pro, but I was uncomfortable flying with someone whose English is about as good as my Mandarin. I went to Google Translate and found some key phrases on Google Translate: I have control! We are returning to base! I wrote the translation on a sticky note, and we rehearsed the phrases, but when I tried it out in the air, he had no clue what I was talking about. Luckily, the flight was uneventful, but after several flights with this student and others who don’t speak English, I’m not going to do it again. However, even when a student speaks fluent English, cultural differences can surprise you. One of my students from the Emirates uses “Inshallah” a lot—“God willing.” It’s his custom, and I don’t have a problem with it, but when I tell him he’s doing well during a maneuver and he says, “Inshallah,” while we’re staring straight down at the ground, I have to say it made me a little uncomfortable! Some communications are crucial to set in stone before you take off. Probably the most valuable phrase an instructor can use is: “I have the controls!” Along with the verbal cue, I usually give the stick a little shake at the same time to signal the transfer of control. As our Swiss student says: “The shaker is the taker!” A good akro instructor, especially a smaller in stature one like me, needs to practice the “I have the controls” mantra with every student before they actually need it. Sometimes non-verbal cues are little help. Recently I flew with a student who flew his Extra to our school for some inverted spin training. We started with inverted stalls, then progressed to inverted spins. As we started increasing the number of spin rotations, his grip on the stick become tighter, so I told him to just let go and watch how quickly the airplane would recover on its own. On our next lesson, he put a Go Pro on the wing and a mic chord hooked up to our headsets. As we were spinning inverted, he tensed up, and I told him, “Let go.” He didn’t, so I said it again, “Let go!” When he didn’t again, I had to yell, “LET GO!” Spinning through 3,000 feet, I was finally able to get him to pry his hands from the stick. We recovered and continued the lesson, and after we landed he showed me the video. I could hear myself yell, “Let go!” and found it a bit disconcerting to hear it on an intellectual rather than a visceral level. Miscommunication has caused airplane accidents, started wars and probably caused the demise of more than a few otherwise good human relationships. It’s very important that good rapport be established between a flight instructor and student, as much as between a captain and a first officer. Communication doesn’t have to be complicated (as the old aviation joke goes: “Sit down, shut up and don’t touch anything!”); rather, it should be simple, direct and understood by everyone. It might be the most important thing we have in our toolbox as flight instructors. Patty Wagstaff is a three-time U.S. National Aerobatic champion, inductee of the National Aviation Hall of Fame and one of the world’s top airshow pilots. Visit pattywagstaff.com/school or reach Patty via email through [email protected].